“The state has to guarantee by law equal opportunities for everyone. As we combat shadow economy in one sector, we must not put employers and employees in other sectors in disadvantage,” the president said, returning the bill, which was approved by Saeima on November 1, to lawmakers. 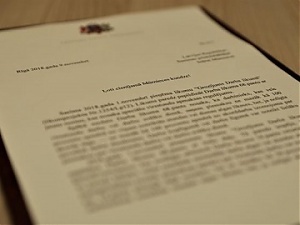 Vejonis praised the Latvian Employers Confederation, the Confederation of Free Trade Unions of Latvia, the Partnership of Latvian Construction Entrepreneurs and the Cabinet of Minister for their efforts aimed at combating the shadow economy and promote the conclusion of general collective agreements as provided by the Labor Law. However, the president finds the amendments to the Labor Law to be too fragmentary and incomplete. It is not acceptable to try to fight unreported business activity in one sector without assessing the risks the new regulation can pose in other sectors, Vejonis said. “It is not possible to approve a regulation that gives those businesses that are leaving the shadow economy an advantage against those that are already paying their due taxes and contributing to financing the common needs of society,” the president said. As he returned the amended Labor Law to the parliament for revision, President Vejonis asked Saeima to assess the proportionality of the regulation and find a balanced solution in line with the Constitution. As reported, Saeima on November 1 passed in the final reading amendments to the Labor Law allowing employers to slash extra pay for overtime work by 50 percent if the employees in the given industry have concluded a collective general agreement, which in turn increases the minimum hourly wage in the industry. Under the current regulation, the extra pay for each hour of overtime work is 100 percent of the standard hourly wage.